Amanda and I woke up at 4:30 with the hope of leaving the house by 5:00. We ended up putting the boys in the car in their pajamas and were on our way by 5:15. Upon arriving in Frederick we waited in traffic for a few minutes before parking in a field (at 6:15) about a 1/4 mile from the Frederick Fairgrounds. Here are some details from the rest of the morning. The race started and I immediately found myself in the lead. I was running at what I felt was a conservative/comfortable pace that I would be able to pick it up from as the race continued…the first mile was 5:09. I picked up the pace from there and ran just below or above 5:00/mile for the entire race (splits are posted below). I didn’t look back much at all during the beginning part of the race, but I knew Tekele GebreluiI and Gurmessa Mergessa were both there the first 2-3 miles. I could see the shadows as well as hear the breathing and footsteps of two other runners. I knew it had to be them as I saw both of them on the starting line. There was a point after 3 miles where I was able to look back while making a turn and realized it was just me and GebreluiI. I ended up leading the race for the first 10 miles. GebreluiI would not take the lead even if I slowed down the pace. It was frustrating as there were long straightaways with a decent headwind and he would just stay right behind me. I was frustrated, but I guess it’s just racing…maybe he wasn’t able to come to the front and push/continue the pace and was “hanging on”…?, but if I slowed he wouldn’t lead! A little after 10 miles I slowed down enough after grabbing some Gatorade from a water stop that GebreluiI actually went into the lead. I quickly realized that the pace was actually slowing down with him in the lead so I ran up along side of him and threw in a surge (on a nice long downhill) and pushed for about :45….but he was still there. He continued to stay in that same spot I had become so familiar with! I thought back to something my wife (Amanda) has mentioned to me in the past. She has said that maybe it would help to try to get “mad” later in the race and maybe it would give me that extra push/gear. 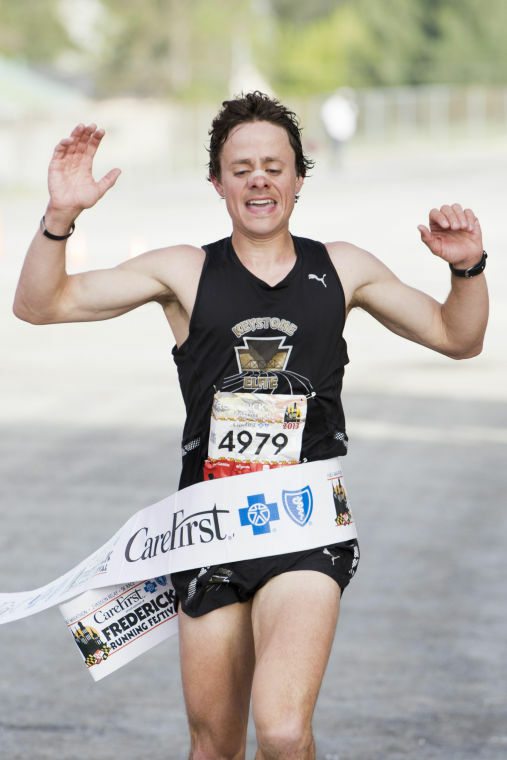 This isn’t something that comes easy to me in races…I’m not saying I don’t get mad, ha! I’m saying that it’s something that does not come naturally to me during a race. I tried it. I thought about all the work I have done over the first 10 miles of the race and how it would feel if he ended up winning the race after everything I had done. I threw in a few more surges over the next 2 miles. Each surge was between :30-:45 seconds and they were pretty hard…I felt like I was running a fartlek workout and not a race. Fortunately I have done some workouts like this in training and I was able to recover fairly quickly after each surge. GebreluiI was still there! He dropped back a little bit during each surge, but would quickly get right back in that familiar place right behind me. This time it was different….his breathing was more vocal! A co-worker from school (Lisa) had told me about a steep hill at around 12.5 miles just before entering the stadium. She said that it was the biggest hill on the course. We made a couple turns just before 12.5 miles and then I saw the “hill”. It was definitely steep and it was not a fun place (12.5 miles) for a 200 meter hill to be located in a half marathon. I don’t remember what exactly went through my head, but I made the split decision to run up that hill like it was the last 200 meters of the race. I knew there was still 400 plus meters to go, but I went for it. I looked back after getting to the top of the hill when turning onto the horse track and realized he had finally dropped! I was hurting badly, but I was able to smile at the lead biker and say “he dropped!”. It was both exciting and relieving. I have won races before, but this one was different. Not only did it feel good to win, but it felt relieving. I was relieved that I was able to pull it off after leading for basically the entire time and doing 100% of the work. I can’t tell you how many times negative thoughts came into my head over the last half of the race. I kept thinking about how I’m doing all of this work and it hurts so bad, yet it’s all going to come down to the end of the race! When I let him take the lead just after 10 miles I was really considering just cruising in and giving up, but I quickly snapped out of it and realized that since letting him lead the pace was actually slowing down. This was reassuring as it showed that he was hurting too! I don’t remember why I made that split decision to push up that last hill. In hindsight it was a great decision as Gebrelui couldn’t respond and thankfully I was able to cruise in the rest of the race on the horse track as I don’t know much I would have been able to kick if I had to do it all over again! It was amazing having Amanda and the boys out there cheering for me on the course. I love the fact that they come out to support me! It was a wonderful course for spectating as they were able to see me at the start, 2.5 miles, 7 miles, and the finish. The course profile was definitely deceiving. I actually went into the race thinking it wasn’t going to be hilly at all and I was wrong. There were not any monster hills (other than the one with 1/2 mile to go! ), but it was rarely ever flat. Some of the hills (both up and down (4:48 5th mile)) were very long and gradual. When you group the hills with the large number of turns and the occasional headwinds on the course it actually makes it out to be a rather challenging course. Now, with that being said I actually loved the course. The constant ups/downs and turns reminded me of a cross-country course. I loved running up/down the hills and accelerating around the turns! Corrigan Sports did a great job with the race and I would definitely recommend the race to others in the future. 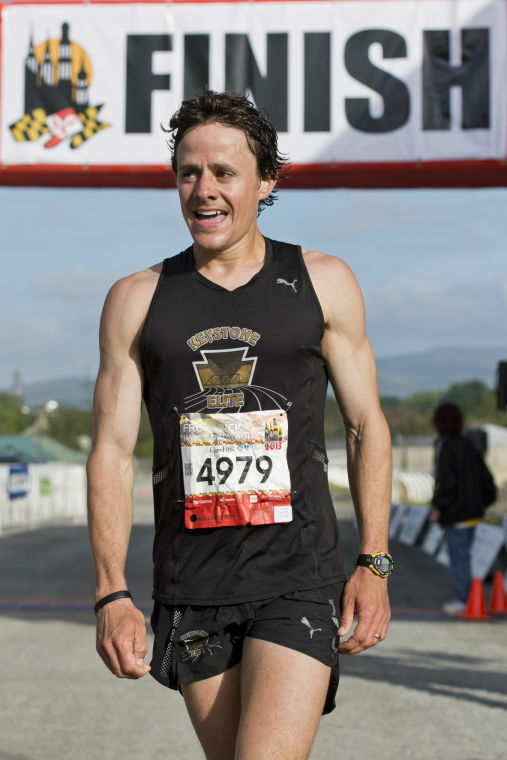 Pocono Marathon is in less than 2 weeks. I have said this several times before, but maybe I’m finally ready for that breakthough marathon! 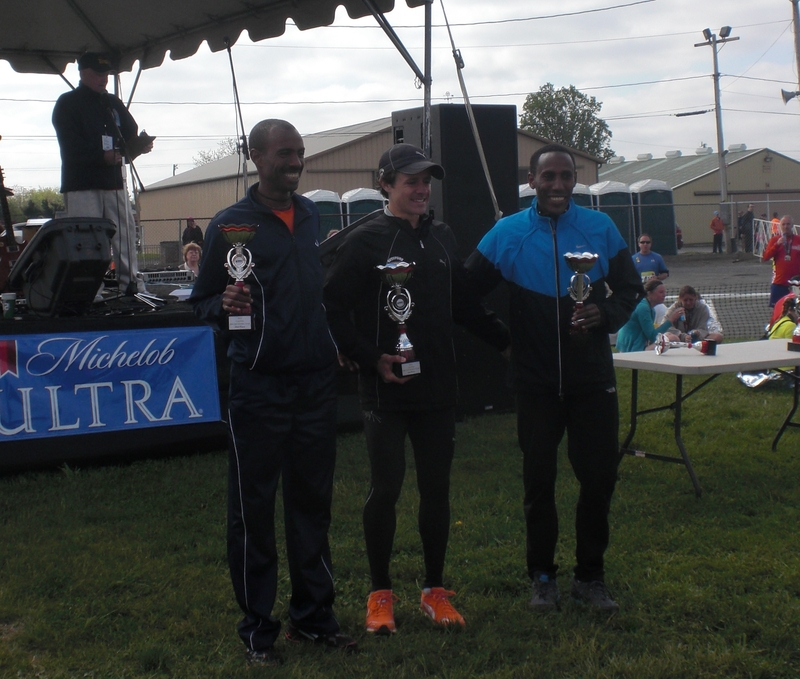 This entry was posted in Uncategorized and tagged 1/2, baltimore, berdan, dave, david, frederick, half marathon, keystone track club, Maryland, md, puma, run, running, training on May 7, 2013 by daveberdan.